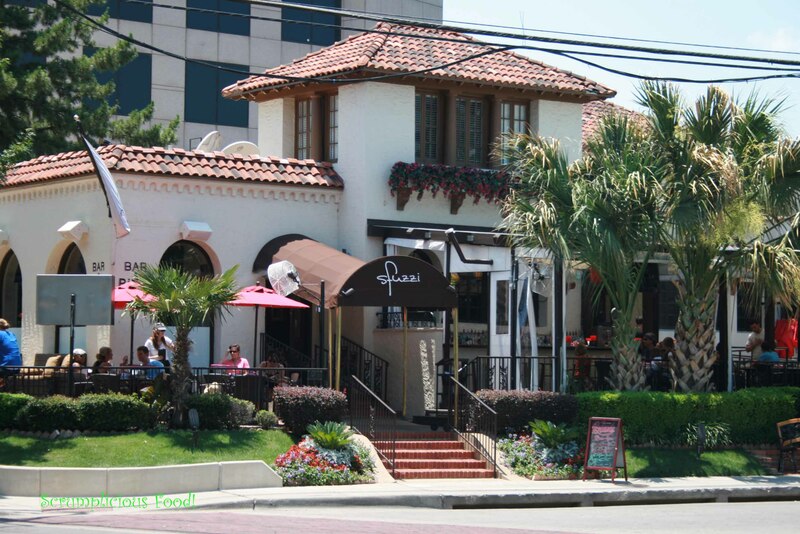 The photo above shows a truly beautiful, Spanish-style building that was built in 1927 at the northwest corner of McKinney Avenue and Routh Street. The view shows the Routh Street side. The person who took this photograph would have been standing across the street on the property of the dearly-departed McKinney Avenue Baptist Church (most recently transformed into the Hard Rock Cafe). You might be surprised to learn that the building in this photo still stands, and it’s mostly recognizable almost 90 years later. The Community Chapel Funeral Home (yes, a funeral home!) was designed by noted architect Clarence C. Bulger (whose father, C. W. Bulger, designed, among other things, the Praetorian Building downtown AND the just-mentioned McKinney Avenue Baptist Church which was right across the street). In addition to the funeral home portion (reception area, business office, show rooms, “operating room” (! ), chapel with seating for 100, and the euphemistically named “slumber room”), the building also contained a residence for the chief mortician and his embalmer wife, an apartment for the ambulance/hearse drivers, and a “pavilion for recreation of employees.” The building and its beautifully-appointed interior cost in excess of $100,000 (which the Inflation Calculator estimates is the equivalent of more than $13 million today!). Also, an “oxygen plant” was somewhere on the grounds. I’ve never heard of an oxygen plant, but they seem to be a mortuary thing. Let’s hope recently-bereaved smokers were kept at a safe distance from all that highly flammable oxygen, because the company had a bunch of promotional matchbooks printed up, and I can only imagine they were readily available in tastefully-arranged candy dishes of every room of the establishment. And in those days, one didn’t necessarily step outside to smoke one’s anxiety away. 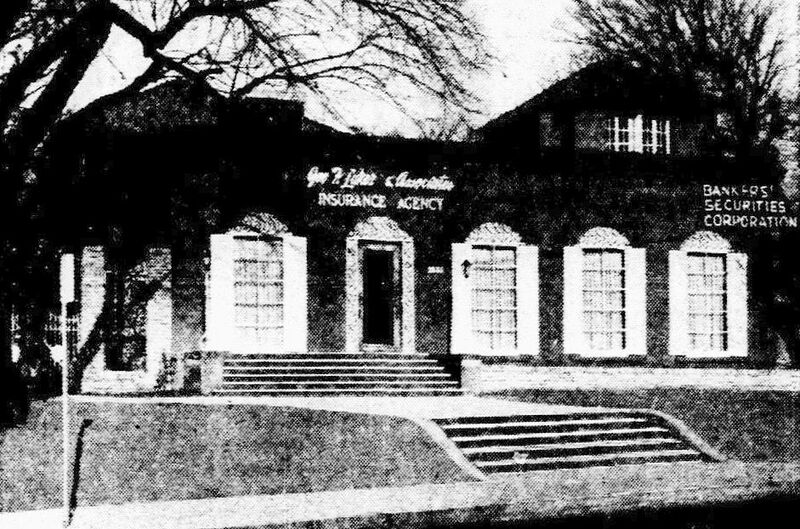 For the next 40-odd years, 2533 McKinney Avenue was home to a variety of insurance agents, a fur salon, several companies that advertised in the classifieds for vague “salesmen” positions (one company did specify that it was looking for encyclopedia salesmen in 1963), art galleries, architect/design businesses, offices of “El Sol de Texas” (“the only Spanish-language newspaper in North Texas”), and antique shops. It all turned around, though, when the long-suffering building was re-renovated and became a restaurant space. Since at least 1999 when Uptown began to explode, it’s been home to bistros, cafes, and upscale eateries. The photos below show some of the restaurants that have set up shop there, and if you know what you’re looking at, the place really does look very similar to C. C. Bulger’s design from almost 90 years ago. Le Paris Bistrot opened in 1999. The owner changed the name to Figaro Cafe in 2004 when the U.S. was going through an anti-French phase. Urbano Paninoteca opened in 2007. Something called Split Peas Soup Cafe opened in 2009. Then Sfuzzi opened with a big splash in 2010. (It had been a McKinney Avenue staple in the 1980s and ’90s, closed, and came back in 2010.) The first photo shows the Routh Street entrance, the second photo shows the McKinney entrance. And let’s hope that those tiled roofs and stuccoed walls remain a distinctive part of its future. I love the fact that it still looks a lot like it once did. And I actually like the fact that restaurants have been operating out of an old funeral home for over 15 years. Restaurateurs might be hesitant to publicize the building’s past (although I’m pretty sure most of them have been completely unaware of what the place used to be), but modern-day Harolds and Maudes might be giddy at the prospect of an unusual dining option and move this place right to the top of their date-night list. Top photo is a detail of the ad that appeared in the 1929 Dallas city directory. It shows four Cadillacs — a hearse, 5- and 7- passenger sedans, and an ambulance (“purchased from the Prather Cadillac Company”). Matchbook artwork from Flickr, here. The first Sfuzzi photo is from the food blog Scrumplicious Food, here. A GIGANTIC version of the photo can be seen here — you can look at all the details. Second photo of Sfuzzi from Yelp. Fat Rabbit image from Google street view. Sources of all other clippings and photos as noted. Some images larger when clicked. it is a very good story a work of art and you have found all of the right things too tell this story, years ago we used too play in back of that place and too think it was that kind of a location…..this is by far a great story thanks so much fro serving the community……. Over all that is the only building left on that block, I found and article on the Harry home built in 1889 at the Corner then it became the arts schools over the next 3 decades and a studio for Chapman Kelly when he came too Dallas then later torn down for a parking lot for the Chateaubrian Restaurant…which open din 1955 then it was removed for the present ugly building…..
Uptown used too be called The Oak Lawn district in the 50s and 60s and was the real location for The best shops in Town in the Cultural effects of finer things in life…..This site helps make Dallas a much better place too know, by far I am reading….And thank you for your complement…. Awesome article as always! I had a small shop in the Quadrangle in the early to mid 70’s and lived at Hall and Carlisle, so I’ve been very familiar with that unique building for a long time. It has indeed had many incarnations but it was really well built. I love all of the side trips which you provide with your “click here” and photo enlargements! I was supposed to be in bed sound asleep an hour or more ago! Nothing like your wonderful stories of early Dallas. I love everything you write. I was born in Dallas and returned to study at SMU, 1960-64. I know just enough to understand most of Dallas that you talk about. Thank you, Paula! Always a pleasure !! and…hasn’t Dallas changed ? Thanks so much, Jan! Dallas is constantly changing — this stretch of McKinney has changed ENORMOUSLY in just the past 5-10 years. I have worked in this building for nine years now and have always been fascinated by its history. I can only seem to find what was on the Mckinney side of the building but not the other half. Through the years I have had many people come through Renfield’s saying they worked in that building for various companies but I cannot substantiate their claims. You seem to have the most information available. Can you help me or at least point me in the right direction?